Today I tried out a new set of skis from Dynafit. They are SR 8s 160cm, 93,67,83 with speedlight toe pieces, and low tech heal pieces. Their combined total weight is 2kg. They are fast light ski running/ racing skis, and with this in mind they ski extremely well. As far as Dynafit goes, I guess I'm a total convert! 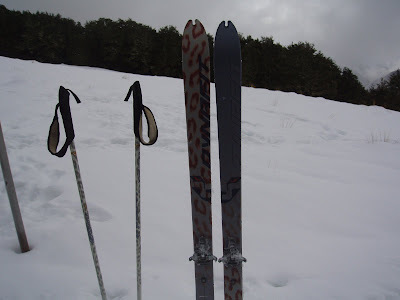 I prefer the light and fast approach to ski mountaineering, so I guess in those terms these skis suit my needs extremely well. They do the job they were designed for which is just what I wanted. So anyway to prove how good they were (to myself) I strapped them to my back and ran/ skinned up Bealy spur to pt 1584m. So that's about 1000m in elevation and 16.4km in distance. It took 4 hours, which was a while, but I came back feeling as if i'd been for an equivalent mountain run. I was hoping to get up to pt 1907m. 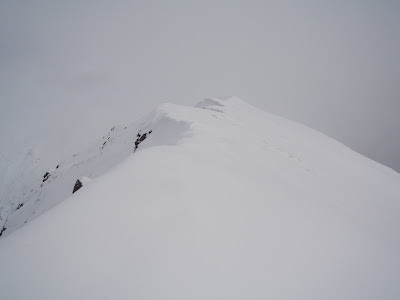 But the visibility was so poor at times it was getting hard to see which side of the ridge I was on, so I thought it prudent to leave that for another day. Photos: The skis and the ridge.